Daft Punk: what do they have up their sleeves? 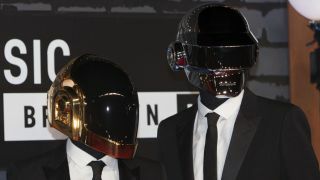 In keeping with their album Random Access Memories' lavish production values, it's being reported that Daft Punk are planning to put on a star-studded show at the 2014 Grammy Awards. Pitchfork writes that the duo, who are nominated for four Grammys (RAM has a further five nods), will perform not only with recent collaborators Pharrell Williams and Nile Rodgers, but also Stevie Wonder and the session players from their 2013 long player. These include Chris Caswell (keyboards), Nathan East (bass), Omar Hakim (drums) and Paul Jackson Jr (guitar). What the French duo's role will be when they take to the stage remains to be seen, but it seems that this will be a very different kind of performance to their surprise appearance in 2008, when they collaborated with Kanye West on a reworked version of his hit Stronger. This will be Daft Punk's first live outing since Random Access Memories was released. All will be revealed on Sunday 26 January, when the 56th Grammy Awards take place in Los Angeles.